Patrick Dangerfield finished with a careerhigh 14 clearances. Since 1999 only Mark Ricciuto has won more in a game for the Crows. The Crows won groundballgets 106-88. The Power scored 59.5 per cent of the time they went inside 50, up from 41.4 per cent in the first four rounds. The Demons have scored 51.9 per cent of the time they have gone inside 50 in 2015, ranked first. Adelaide Crows InterchangeNathan Van Berlo replaces Ricky Henderson and is possibly out for the game. Crows InterchangeRicky Henderson and is possibly out for the game. Kane Cornes has won four clearances. His fourth launched the Power's seventh goal from stoppages. Patrick Dangerfield leads all players with 12 clearances, followed by Robbie Gray with 11. Both teams have scored two goals from turnovers in their defensive 50. The Power have created 22 more. The Crows have scored two goals from forward 50 stoppages this quarter. They lead clearances 4127 but both teams have scored six goals from stoppages. The Power have scored 4.2 (26) to 2.2 (14) from forward half turnovers despite creating 18 less. 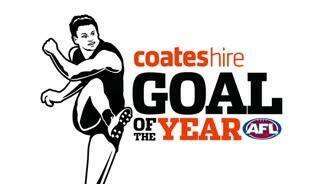 All four goals this quarter have been sourced from stoppages. The Crows lead clearances 43. Adelaide Crows InterchangeMatthew Wright was substituted into the game for Rory Sloane. Port Adelaide InterchangeJared Polec was substituted into the game for Jackson Trengove. The Power have won five stoppages in their defensive 50, gone inside 50 from three of them and scored one goal. 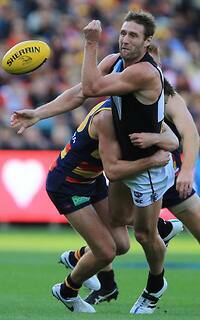 The Crows have won six clearances in their forward 50 and scored 1.1 (7) from them. The Crows lead groundballgets 73-63. The Power have played on following a mark 36.3 per cent of the time, down slightly on 39.9 per cent across the first four rounds. Only the Kangaroos play on following a mark more frequently than the Power. The Crows have scored a goal 16.4 per cent of the time they have gone inside 50, down from 24.3 per cent across the first four rounds. The Brisbane Lions rank 18th with 18.1 per cent. Taylor Walker has grabbed two marks inside 50 for the game and 19 for the season. No player has grabbed more marks inside 50. The Power have scored 3.2 (20) from 11 turnovers created in their attacking midfield. The Crows have scored 1.1 (7) from 14 turnovers created in their attacking midfield. The Power lead clearances 64 this quarter and have scored 2.0 (12) to 1.1 (7) from stoppages. Brad Ebert has won two clearances, both launching goals. Crows InterchangeRicky Henderson off due to an injury. 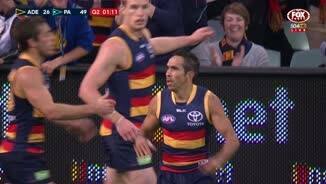 Crows InterchangeEddie Betts off due to an injury. Power InterchangeMatthew Broadbent off due to an injury. Welcome to Adelaide Oval for the Adelaide Crows v Port Adelaide Round 5 clash. 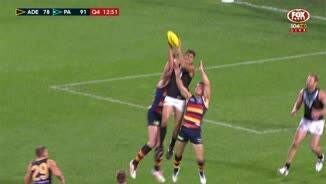 Last time v Adelaide The Crows and Power clash in Round 5, 2015. 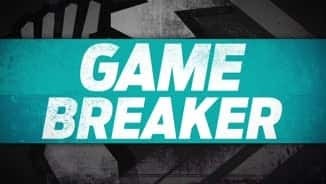 ANOTHER five-goal haul from Jay Schulz has helped Port Adelaide hold off a wasteful but spirited Adelaide to clinch Showdown XXXVIII by 24 points at Adelaide Oval on Sunday night. Schulz backed up his five-goal effort against Hawthorn last week with another goal-kicking showcase, while Robbie Gray (32 possessions, 11 clearances, one goal), Brad Ebert (31 possessions, seven tackles) and Travis Boak (33 disposals, one goal) were dominant through the midfield. Gray's performance earned him the Showdown Medal as best afield in the 18.7 (115) to 13.13 (91) victory. Eddie Betts was a lone star up forward for the Crows with five goals and Patrick Dangerfield put in a typically tough, inside performance with 36 possessions and 11 clearances. The Crows controlled clearances and dominated inside 50s (71-42) but lacked composure for the most part, while the Power were ruthlessly effective in attack. 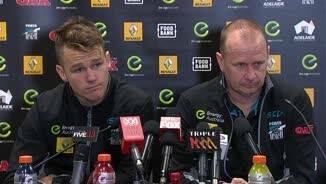 Despite the victory, Port coach Ken Hinkley was concerned by his side's massive discrepancy in the inside 50 count for the second week in a row. "We can't play footy like that all year. You won't survive if you continue to give up that many entries," he said. "Last year we were an elite defending inside 50s team. "We're miles off that at the moment so there's lots of room to improve." 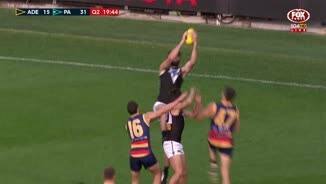 Adelaide threatened on numerous occasions throughout the second half, but each time Port was able to ease the pressure where it mattered most – on the scoreboard. 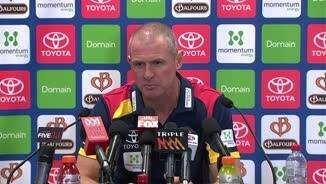 Crows coach Phil Walsh was left to lament his side's inability to take its chances. "We had the ball down our end enough to do some damage on the scoreboard but we weren't able to do that," he said. "I would have liked to have thought in that second quarter and into the third quarter, if we'd actually kicked a couple of goals and got in front I think the stadium was ready to erupt for us. After an even start to the game Port began to find the space required to nail its attacking entries. Good delivery made for easy chances in front of goal as suggested by the Power's 4-1 advantage for marks inside 50 at quarter-time. Adelaide's inability to use the ball when in possession continued into the second term; the difference between the sides highlighted by an unforced turnover that quickly resulted in Schulz's third major against the run of play. The Crows were dominating clearances and attacked relentlessly but was unable to find any value by foot, disposing of the ball at just 19 per cent inside forward 50. The players' lack of poise was cringe-worthy at times, but they somehow trailed by just 17 points at the main break courtesy of another spectacular goal from Betts deep in his self-titled pocket. The little magician struck again early in the third, spinning through three opponents to snap a miraculous goal and Adelaide appeared to have been ignited. Betts had a fifth midway through the term and Taylor Walker bombed his second, but the side's kicking woes still kept any lead at arm's reach. 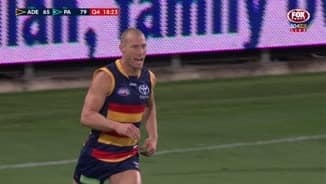 Veteran Crow Scott Thompson twice snapped truly in the last quarter to offer his side hope, but ultimately the Power had all the answers when questioned. With the game on the line in the final term they kicked three straight goals to snuff out any hope of a Crows comeback. Rubbing salt into Adelaide's wounds, star midfielder Rory Sloane was subbed out of the game late with a calf injury, while defender Ricky Henderson hurt his shoulder.